June Johanna Anderson, age 86 years, was born and raised in St. Paul, Minnesota. 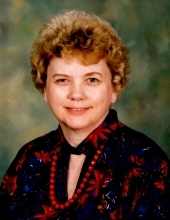 She received a Bachelor’s degree from Sioux Falls College in Sioux Falls, South Dakota, in 1953, majoring in Elementary Education and minoring in Art. She created beautiful works of art throughout her life. In addition, she worked as a medical secretary and transcriptionist. She was a devoted mother to her two daughters. In 2016, June moved from the Altenheim Retirement Community in Forest Park, Illinois, where she’d lived since 2002, to Bridgeway Senior Living in Bensenville, Illinois. Previously, June lived in many locations: Lafayette, Indiana (1984 – 1999); Newport News, Virginia (1974 – 1984); Philadelphia (1967 – 1974); Franklin, Virginia (1963 – 1967); Berea, Ohio (1960 – 1963); Lowell, Massachusetts (1958 – 1960); and Berkeley, California (1953 – 1957). June was an avid reader of both nonfiction and fiction, with a keen interest in history, religion, politics, and social justice. She enjoyed reading mysteries and crime novels, and she loved playing word games. A highly creative artist and craftswoman, June painted, sketched, sculpted, sewed, built furniture, made lamps, and worked with stained glass, leather, and other media. She also liked to sing and play hymns on her keyboard. June is survived by her daughters, April Nauman of Oak Park, Illinois, and Connie Busch of Gales Ferry, Connecticut; by April’s daughter, Maggie O’Brien of Chicago; by Connie’s children, Dorothy (Dustin) Naumann of Vero Beach, Florida, Robert (Cecile) Busch of Virginia Beach, Virginia, and Paul Busch of New London, Connecticut; by Dorothy’s children, Clara, Evan, and Rose; and by Robert’s children, Kyle and Jackson. Memorial Visitation, Saturday, February 9th, 2:00 p.m. until time of Service, 3:00 p.m., at Dreschler, Brown & Williams Funeral Home, 203 South Marion Street, Oak Park, Illinois. 400 Washington Avenue, Montgomery, AL 36104, or American Society for the Prevention of Cruelty to Animals (ASPCA), PO Box 96929, Washington, DC 20090. To send flowers or a remembrance gift to the family of June J. Anderson, please visit our Tribute Store. "Email Address" would like to share the life celebration of June J. Anderson. Click on the "link" to go to share a favorite memory or leave a condolence message for the family.